As the good old band "Lynard Skynard" once said: "Tuesday's Gone" but not today... Well not yet at least as it is Tuesday which means that it's time for the second day of "Godzilla Week 2014". 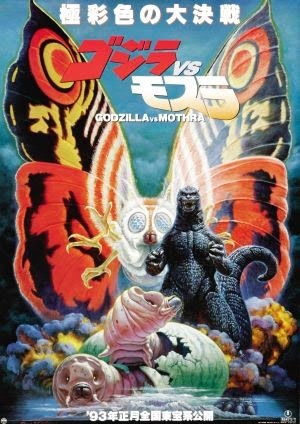 Terrible talk show intro aside today we'll be taking a look at the second film of the "Heisei Era" of Godzilla films, "Godzilla Vs. Mothra: Battle For Earth". 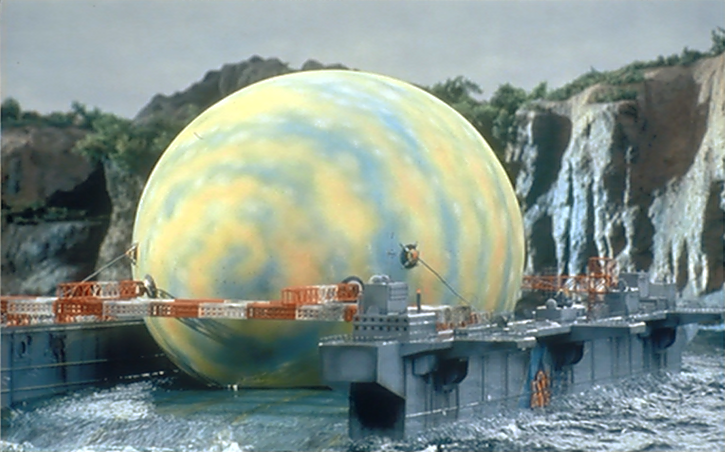 Godzilla Vs Mothra: Battle For Earth starts off with a giant meteorite landing in the ocean causing a typhoon to hit revealing a Mothra Egg on an nearby island. That's not the worst of it as the meteorite has also caused Godzilla to awake from hibernation. We then cut to a very Indiana Jones adventure scene where we see a guy dressed like John Rambo taking a treasure from a temple. Once he escapes after setting off a trap he gets arrested and thrown in jail. While in jail he is approached by a group of scientists with one of them being his ex-wife and is requested that he helps them out in bringing the Mothra Egg to Japan otherwise he is going to rot in jail. Once they capture the egg they are attacked by a very cranky Godzilla and during the battle the egg hatches and a baby Mothra starts to attack Godzilla right back. 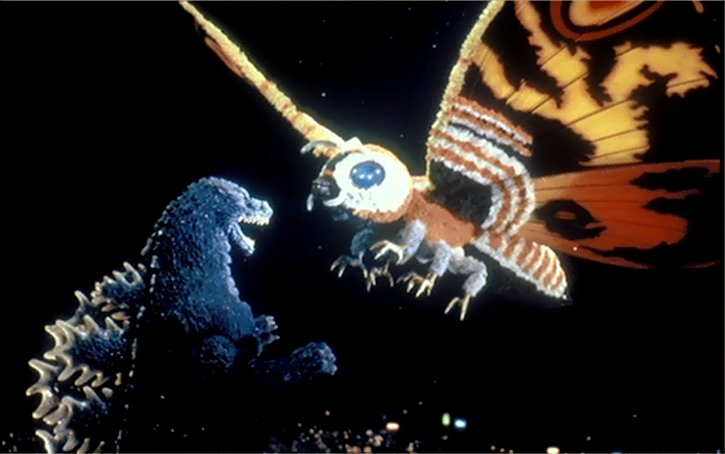 They are not alone as another baby has hatched not far from them but this baby isn't so nice and starts attacking both Godzilla and Mothra. Turns out the baby is named Battra and is an evil cousin to Mothra. After not being able to capture the egg they come back with something special and that thing (or things in this case) are Mothra's keepers, the Twin Fairies. 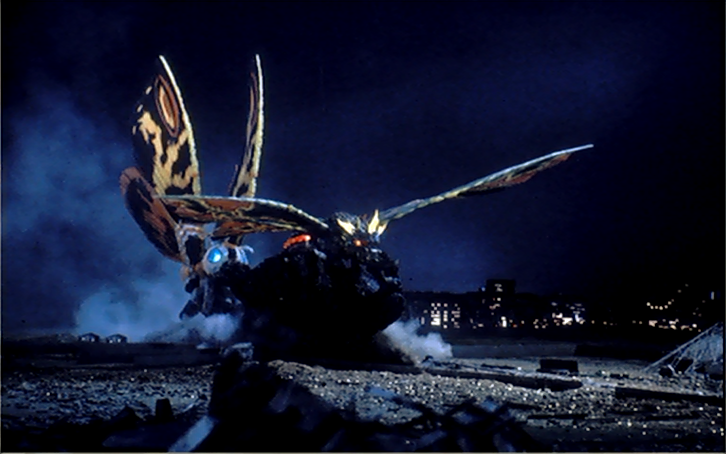 Mothra isn't too happy so she starts to head to Japan to rescue them. Ruuuunnnn! Its Mothra! (Click "Read More" to read the full review). 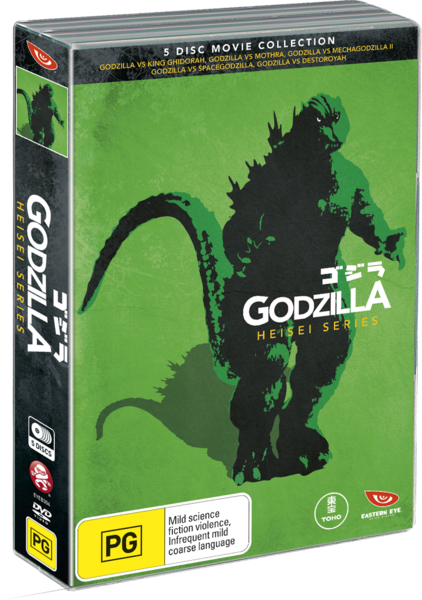 The story in this one is pretty standard for a Godzilla film but there is one thing that makes this film a little bit different compared to most of the Godzilla films and that is this film is mostly about monsters doing battle. The part of the film with the human characters were alright but nothing amazing. It does however set up the film pretty well and you do get some decent adventure scenes inspired by the "Indiana Jones Series (1981 -2008)". Some of the drama scenes to where they wanted you to get to know the characters a bit more did feel a bit forced to where I was like "Go back to the monster fight". It was good to see the Twin Fairies in this one but this film wasn't their strongest appearance as they could've done way more with them. A downside to this film is that it had a rushed ending that felt very cheap and lazy. The fight scenes involving the monsters are very good with some very exciting action that will get you excited. I did find the scenes where a monster is alone to be alright although they can drag on for a little too long. The costumes and puppets in this film looked very good and have aged well. The sets though have aged a little bit to where some of the miniatures didn't blend in well and you can tell that they are toys but most of them have aged pretty well. The special effects in this film looked great and I really liked how they mixed in the laser/bolt effects mixed in with the lighting they use in the film as it adds to the experience that these attacks are really happening instead of thinking "oh man! That was just done with a computer *YAWNZILLA*". One thing I found funny about this film was the blatant product placements. Normally in these films you do see billboards and posters on the buildings but they are typically out of focus to pay focus on the monsters but in this case when you look at the background you will see the typical out of focus faux-advert but then from out of nowhere you'll see a very clear, in your face advert for something like "Namco" and "Nike". I was thinking it was a one time thing but it happens throughout the film to the point where we see a television playing a Godzilla game made by Namco. I'm not saying this is bad or anything but I just found it very interesting and a little funny. The English dub on this film is a little cheesy but a huge improvement over the prior Godzilla film in the "Heisei Series". Most of the voices match up with the characters in a very appropriate manner. The dub still has the problem where the main character sounds like Superman and his female side-kick sounding like Lois Lane. I'm not saying that's a bad thing but it just felt very weird going with those characters but yet enjoyable. You do indeed have special features on this disc but there isn't much but they will satisfy your taste buds nonetheless. You get the theatrical trailer which was decent and I did like the toy ads at the end. You also get teaser trailers and television ads that was interesting to watch to see.. You also get some promotional photos that are screenshots from the film but in higher quality than the actual film. Finally you get the movie poster artwork and it looks very good with some awesome designs that are sure to make your adrenaline go nuts. Overall this was a very solid Godzilla film with some very nice fight scenes but some above average human characters. The fight scenes in this film were enough to giving this film a recommendation although this isn't a film that you'll be watching over and over again. Decent viewing. That wraps up the second day of "Godzilla Week 2014" and on tomorrow's edition I'll be reviewing a film that has Godzilla raging against the machine... "Godzilla Vs. Mechagodzilla" which is also the third Godzilla film of the "Heisei Era". Catch y'all on hump day y'all.